and they will go at great lengths to find it. water, yet, they can't even get a drop. for only moments a day. What they give in return is immeasurable. bath. What a haven our back yard has become. .....:::: Nothing quenches thirst quite like water! And all God's creatures, like us, need water in all seasons. not continue but we can do something to stop it from happening. 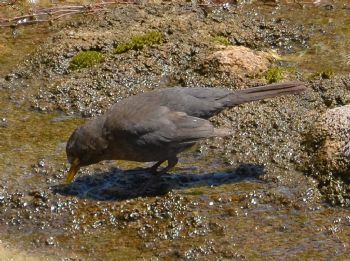 This bird in desperation is trying to drink from what little is there and likely contaminated... When the scorching heat of summer comes and rain is nowhere to be found, we must help. that have blessed us with song. ..
...:::Thanks for stopping by and have a great day! (P.S. One person wrote me to say, "I have never ever heard of birds dying from lack of water." ... If you do a search and put the words in "Birds dying from lack of water" .... there will be plenty but incredibly sad to see .... or hop on this link provided. 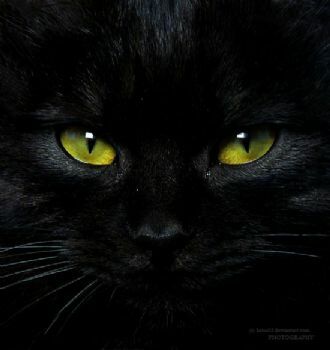 The black cat looks like one of mine! Great blog! 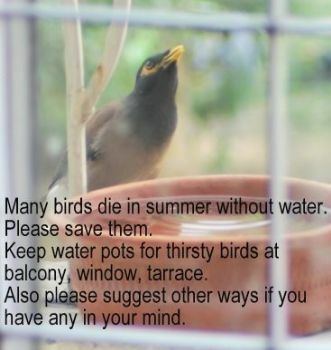 I had read on this information before and just today i did put some water and hoping if any bird need a drink they can have it. I have a bird bath now I am going to set more out back in our yard. & under the one tree I also have out front I have one in my flower garden. The one lady said she never heard of birds dying from no water. Every living creature & human needs water to live our cells are surrounded by water. I worked in a pharmacy for 27 years you can always tell which people drank very little water by their skin so dry & full of wrinkles. Thanks for reminding me that it's time to clean out my birdbath. I am a bird lover, and so are my grandchildren. I think I’ll buy a bird bath! 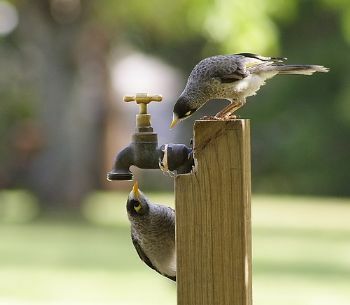 So glad when its Spring and the birds start coming back to Wyoming—but a dry, windy winter—so they will need the water! Thank you so much for sharing! I never really thought about this. I'm going to look into making a bird bath in my backyard. I think my girls will love it. blog! Thank you for sharing. I will make sure to keep water outside for the birds. 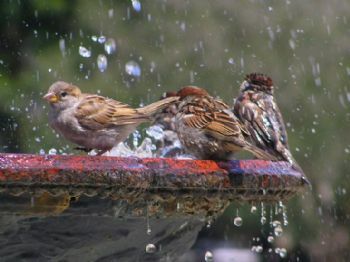 Not all that long ago--people used to all have bird baths. Putting rocks in the pool is a good idea. Anything with slippery sides such as a dog bowl can trap small birds. A brick or block of wood in the bottom can provide a way out. Good message for the birds, although important not to let mosquitoes breed and spread disease. Okay I will put out a dish for the birds. Thank you for thinking kindly about our avian friends. 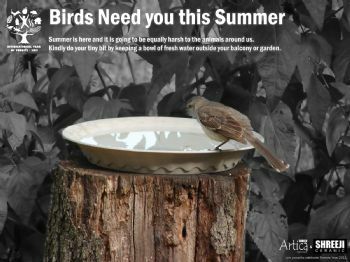 I take care of the birds that visit my backyard...bird feeders and a birdbath filled with water. I remember to feed them in the winter, but had never thought about that same need in the summet. way to set up a bath or water bowls for the birds. Never realized that some die due to lack of thirst and water. I will put out tomorrow! Oh wow, I didn't realize that. Duly noted and I will do what I can to help them. Such a wonderful blog for getting out the word to all us sparkers. I have 2 hummingbird feeders and a bird bath always filled with water. Thank you for writing this. I feed the birds but don’t put water out. And no I’ve never heard of birds dying due to lack of water. We live by a reservoir and have multiple ponds in the area so our birds are likely ok. But now you have me curious to learn and ask more. We have an ornithology center nearby...I will ask. Thanks! I live in Michigan, my hubby and I are bird watchers and feed the birds during the winter. We have a bird bath that is heated. We have a couple of blue bird houses on our property and we had 4 blue birds that stayed during the winter. We feed them dried mealy worms and we have planted our yard to help the wild life. We also have pictures of our neighbors cat, standing on hind legs drinking water out of the bird bath! We have seen quail, turkey and even a fox this winter. Looking forward to warm weather so I can get out and start playing in the dirt! My parents are birdwatchers. They always make sure there is plenty of food & water for them at their house. Thank you for the reminder to put out water for the birds. They, like the bee's, are needed to help the rest of the world survive. for those in mosquito territory, a solar fountain insert helps keep the water moving and fresh! Thanks for the birds. We have a pool and in the winter a lot of birds migrate. We feed all year round. We have crows, they come round to pick up the carrion and in the cold sunny days they have to find what they can. They call, and I put out table scraps and I watch them and they are always three. Their call in the morning so I am inside so I throw out of our kitchen window. The yard is fenced so the cats can not get to the food. They are all fat cats so I watch for skinny strays and I will call the pound and it will be fed and hopeful someone's companion. In Maine we have so many birds its a Joy to live here. Pat in Maine. Interesting. Like GGSpark we get reminders on the news and in local papers to not leave out standing water because it attracts mosquitoes. I wonder if leaving out water and having natural mosquito repellants like citronella on the bowl (not in the bowl) would help. Thanks for this information. I never knew birds died from lack of water. Where I live, it rains all winter, but no rain in the summer, which has to be really bad for the birds. I am going to be sure there is water for them in my backyard now for sure. Plus, the birds help keep the bugs at bay. Thanks for posting. We keep a birdbath in the backyard. Something else we can do is to clip any plastic rings so birds and other animals don’t get entangled. I will put in a bird bath! I live near a lake so the problem might be worse in the winter here when the lake is frozen. Wow I like the picture you see in your window everyday! 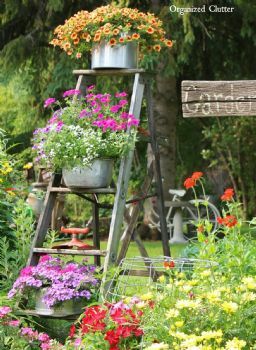 We keep the bird bath and bird feeders full! Interesting and new to me. We are encouraged to remove all standing water from our balconies. To prevent West Nile mosquito breeding. Dilemma ! I will put water out there for them everyday! Thanks for posting! We have a couple of bird feeders in our yard and a birdbath that I try to keep filled. We live close to a couple of ravines where wildlife live and there is a river and the ocean all within a mile from our house.